Deborah Antai-Otong, MS, CNS-BC, Psychiatric MH Nurse Practitioner, FAAN, is a Board certified specialist in psychiatric mental health nursing; a Psychiatric Mental Health Nurse Practitioner, author and national speaker on psychosocial and mental health organizational consultative topics including addiction, depression, bipolar disorder, psychopharmacology, and psychiatric emergencies. 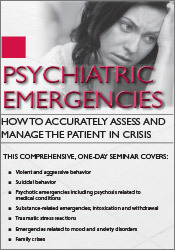 In addition to having authored multiple publications in book chapters and journals, Ms. Antai-Otong has authoredPsychiatric Nursing: Biological and Behavioral Concepts, Psychiatric Emergencies: How to Accurately Assess and Manage the Patient in Crisis,Nurse-Client Communication: A Life Span Approach; and Psychiatric Nursing Pocket Guide. She is also on several editorial boards and is a manuscript reviewer for nursing and non-nursing refereed journals. She is a nationally-sought speaker and mental health consultant. A lifelong learner, she received her undergraduate BSN degree in nursing and Master’s degree in Psychiatric Mental Health Nursing from Texas Woman’s University and Post-Masters Psychiatric Mental Health certificate from the University of Texas at Arlington. She has extensive clinical experience in psychiatric emergencies and organizational consultation. Financial: Deborah Antai-Otong is a Continuous Readiness Officer for the Veterans Integrated Service Network (VISN) 17. She is an author for PESI Publishing & Media and receives royalties. Ms. Antai-Otong receives a speaking honorarium from PESI, Inc.
Nonfinancial: Deborah Antai-Otong is a member of the American College of Healthcare Executives, American Nurses Association, Texas Nurses Association, American Psychiatric Nurses Association, and the International Society for Psychiatric Nurses.